One of the bloggers I follow is reviewing films in his library in alphabetical order. I’ve been enjoying his posts and have responded to several of them. He recently posted on Goldeneye, the 1995 reboot of the James Bond film series. So I am anticipating a great look at Goldfinger next. I did not think it would be right to put all my comments on his page since they are likely to be lengthy, so I decided I would create my own post and link it from his site. I will also link his post when it goes up here. I do all of this because when all is said and done, Goldfinger is my favorite James Bond movie. Double 007, is a character that I have followed since I was seven years old. Bond is my heroin, I need another injection as soon as possible because the rush makes me incredibly happy. Later this year I will get a fix when 007 returns in Skyfall, but for now, let’s stick to the classic cream of the crop. My favorite Bond novel has always been “From Russia with Love”. I read it dozens of times and I loved the movie version. So how is it that a great movie made from my favorite Bond novel falls to second place behind this particular film? It is simple, “Goldfinger” defined what James Bond would be for most of the world. This was the movie that exploded into the public consciousness, this was the story that took Bond from being a secret agent to being an icon. This was one of the most audacious acts of film making to ever become a mainstream hit. For it’s time, (and in my opinion for all time), it invented the modern action film. Sure there had been other movies that featured spectacular action sequences, but none had the personality of James Bond. While at times the movie has it’s tongue planted firmly in it’s cheek, it also keeps us in suspense and creates a realistic scenario for the most outrageous storyline imaginable, a robbery of the gold depository at Ft. Knox. Mainstream films had not seen the amount of sexuality on the screen that Bond made standard for most films that have come after. When your hero manages to turn a lesbian criminal into a hot blooded last minute hero, you know you are approaching epic chutzpa. Goldfinger was the template for most Bond films for the next twenty five years. There was a main villain, a series of women who may or may not be reliable allies, a secondary villain/henchman, sexual innuendo galore, and gadgets. The greatest gadget James Bond ever had in the movies was the Aston-Martin from this picture. When “Q” points out the ejector seat, Bond himself replies “you’re joking”. When we get to see the car in action, midway through the movie, we are treated to three minutes of pure cinema joy, topped off by seeing the ejector seat actually being used. Even with all of it’s tricks though, the car can’t save Bond, and like in most of the books, he has to rely on his personal strength, ingenuity and charisma to achieve victory. There is a lot of humor in Goldfinger, but never so much that we forget we are watching a real story. The over the top gags in the pre-title sequence, never make you feel like it is a comedy, they just punctuate the mood with the right amount of sly humor and fun that any film goer should want. I remember how in “Goldeneye” Pierce Brosnan tries to pull off some of the sexual puns that Connery drops without effort. What was breezy and a little bit naughty in “Goldfinger” was a lot less easygoing and a lot more vulgar in “Goldeneye”. The most recent Bond films have been very serious, which is nice for those of us who want a real spy movie, but It leaves something to be desired still for those who want the “James Bond Experience”. There are a couple of additional elements to mention that make Goldfinger the top Bond film of all time. The image of Shirley Eaton, splayed out on the bed, naked but covered in shiny gold paint, will certainly leave a deep impression. It is sexual and deadly at the same time. That is what Bond has always been about.This became another iconic image from the movie series and perhaps next to the gun-barrel title view of Bond, the most recognizable visual image from almost any movie. 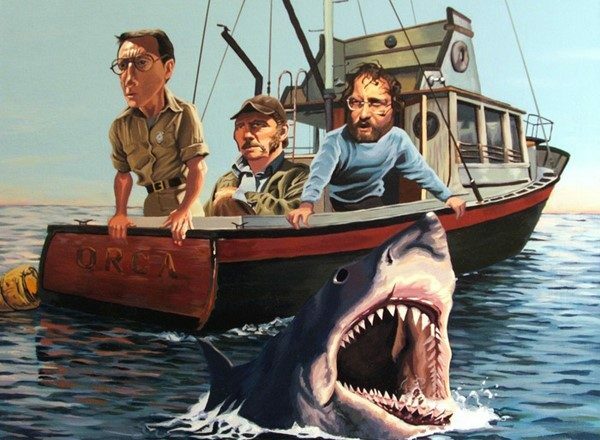 It was featured on the film’s poster, on magazine covers, and in parodies ever since. It is a backdrop for the titles of the film as well. And since I have just mentioned Miss Eaton, I’ll share an image with you that should make you all a little jealous. 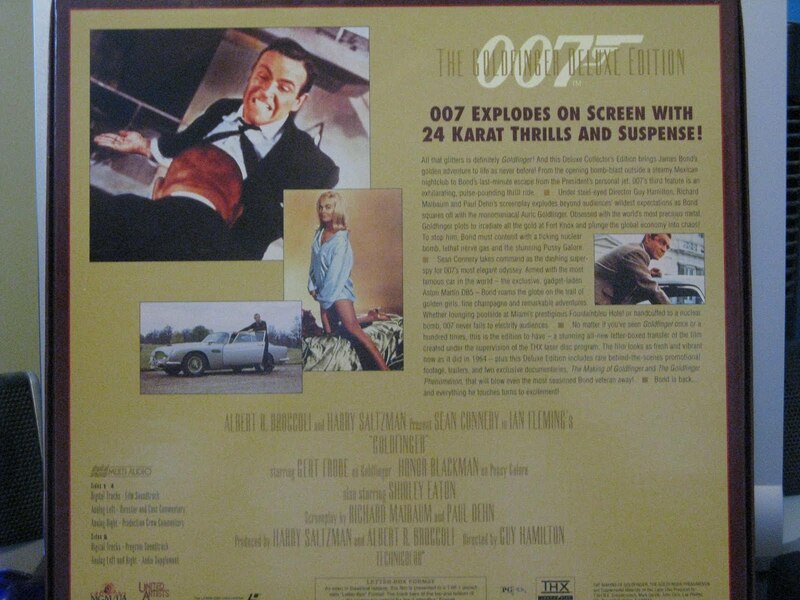 The image here is of a custom printed poster painted for a group that sold these types of Bond memorabilia. 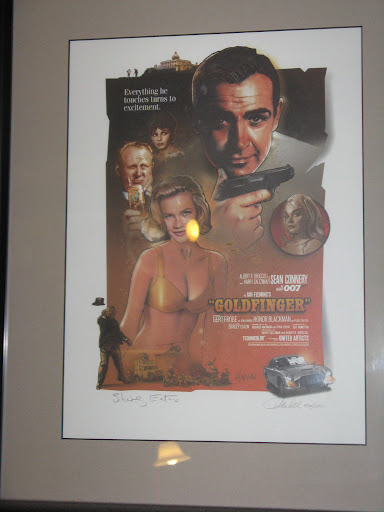 It is hanging on the wall in my family room right now with about eight other posters from the Bond movies, but if you enlarge it a little you will see that in addition to the artist signature on the print, it has the signature of the golden girl herself. The other element that so defines Bond, one that was created with this movie, is the Title song and the score by John Barry. Shirley Bassey belts out a smoky, power ballad with enough imagery and force that the world of 007 would never be the same. Every Bond film since has chased the magic of this title tune. Some have come close, but none can match the lasting impact that this song had. John Barry was previously responsible for music in the Bond films, and he largely created the sound of the Bond theme although the writing credit goes to Monte Norman. This song, and the score of the movie prove that Barry was the real creative genius behind the music of James Bond. He scored many more of the Bond films and his contribution to the movie series cannot be overstated. 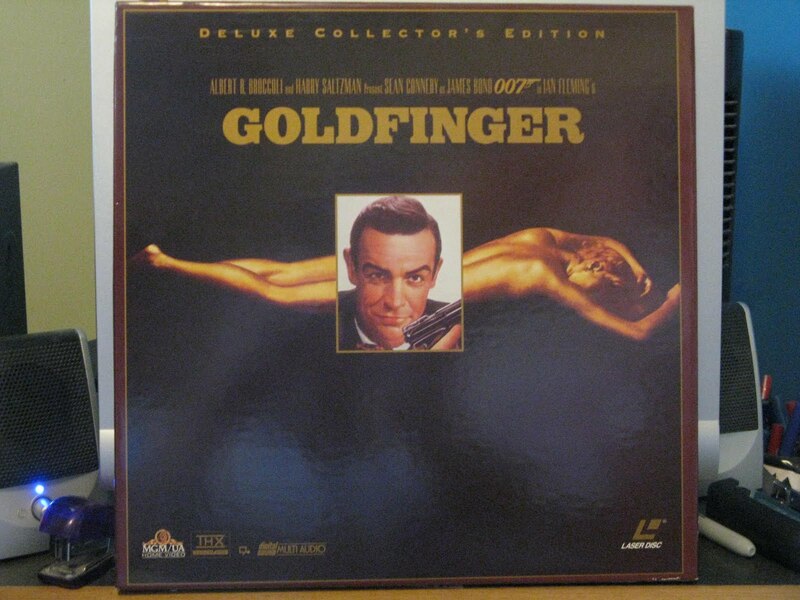 Goldfinger was also the start of the marketing of the James Bond image. His character is used in TV commercials, radio ads, magazine layouts, newspaper stories and a variety of tie ins that are hard to imagine. 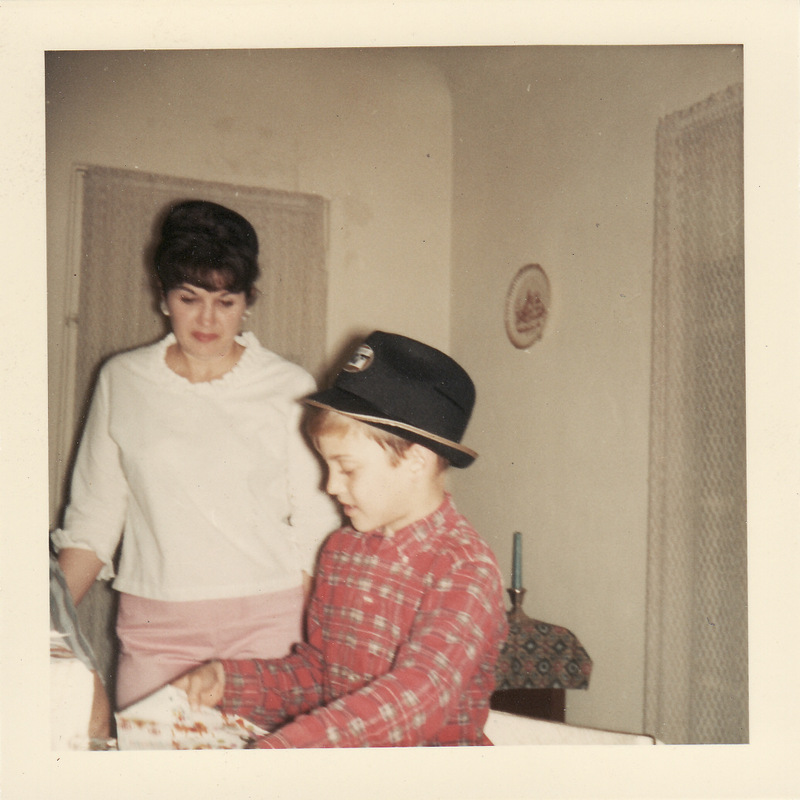 There were Bond toys, collector cards, dolls, books galore. Long before I saw the movie (I did not see it in it’s initial release), I knew the story and the characters because I collected the bubble gum cards and read about the movie in fan magazines. Some of you will hate this, but if you ever get a Movie tie in cup at a fast food franchise, or a toy in a kids meal, or an adult collectible from the movies, you probably can blame Goldfinger, this is the movie that started all of that. 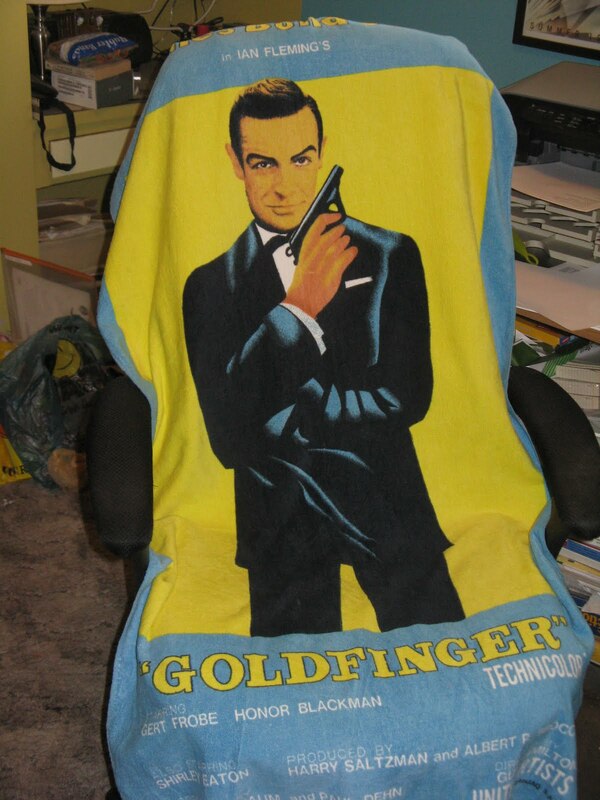 That is the beach towel that covers my office chair and that I sit on every time I am posting to this blog. Those of you who are purists about movies will probably hate this, but to me the movies are not just about the film but the Zeitgeist of the event and my own personal memories. They are hard to separate from one another. I hope you have enjoyed this trip down memory lane, and if any of you wish to dispute that Sean Connery is the best James Bond, go buy another lottery ticket, because you clearly live in a fantasy world. GOLDFINGER is one of the rare Bond films where we get to witness the great tough-as-nails James Bond looking scared out of his wits for his life when he's strapped down and the deadly laser is headed right for the manhood between his legs. Yep. GREAT soundtracks. Worth the price of admission. And nowadays, you can get whatever Bond sountrack (including the original Casino Royale) on CD/LP/Itunes. 😀 This was a very informative post, Richard. Cool deal. I enjoyed learning a little more about your history/love of Bond, that's great. You've got some cool stuff, too! I had the honor of meeting Richard Kiel at Comic-Con and getting his autograph, so that was cool, I have that going for me. Dan, Thanks for looking. Can't wait for Skyfall. I have an idea or two for a 007 project also (Get ready to defend Carly). Hope to see you back here. Do you still have a working laserdisc player? None of my three players currently functions. I keep thinking I need to get a replacement and then a DVD or Blu Ray shows up and makes it superfluous.